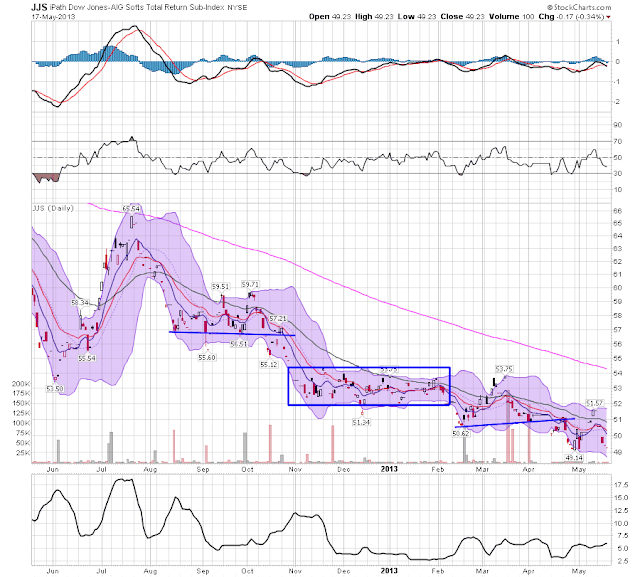 We'll be back on Tuesday, although NDD will be here over the weekend with his indicators. I'm still having issues uploading the pictures. I have no idea what the issue is, but I'm not a tech guy. So, have a safe and happy weekend. Maybe We Should Be Rebuilding Our Infrastructure? I'm still bearish on the French economy (see here and here). The big reason is the terrible history of GDP growth. In 2011 the economy was barely positive and in 2012 the economy has printed three quarters of negative GDP growth. The latest GDP read is also negative. 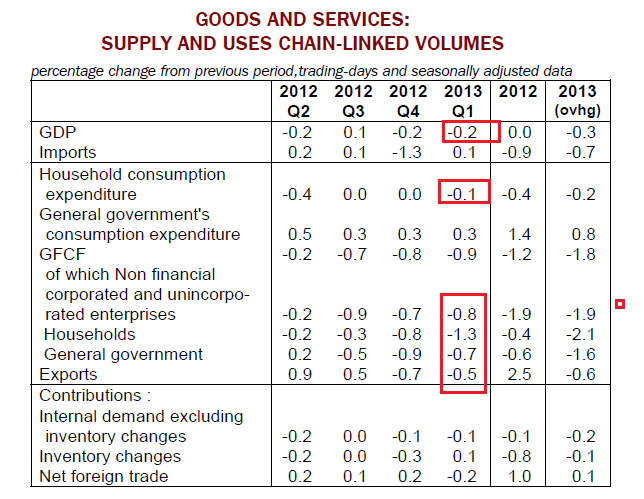 From the report: In Q1 2013, French growth domestic product (GDP) in volume* decreased again: –0.2% after –0.2% in Q4 2012. It is the third decrease in the last four quarters. First note this is the third quarter in the last four where the economy has contracted. 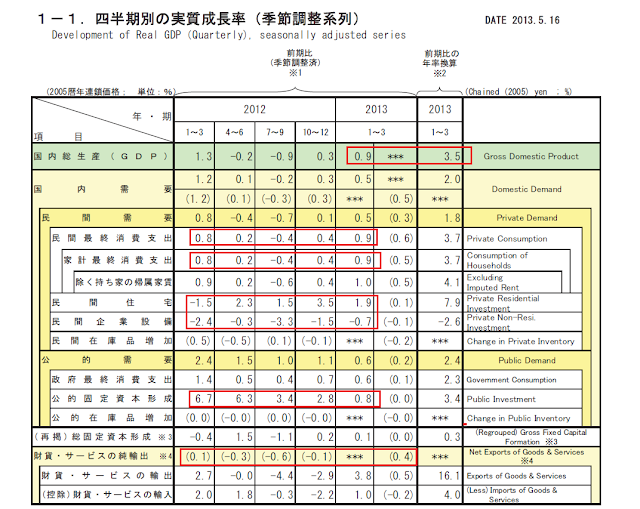 And the respite from contraction in 3Q12 is hardly encouraging, as the economy only grew .1%. Last quarter we see contraction across all major GDP categories: PCEs decreased .1%, government spending decreased .8%, all categories of invested dropped and exports declined -.5%. 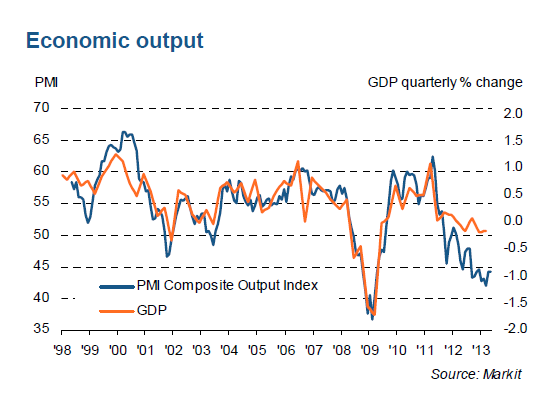 The downturn in French private sector output continued in May. Unmoved from April’s reading, the Markit Flash France Composite Output Index, based on around 85% of normal monthly survey replies, posted 44.3. Although remaining above the levels registered in Q1, the latest reading was indicative of a marked rate of contraction in overall activity. The decline was broad-based across the manufacturing and service sectors, with equally sharp falls signalled in each case. The latest drop in manufacturing production was fractionally weaker than in April, and the slowest in nine months, whereas service providers noted an unchanged rate of contraction in activity. The reading has been below 50 and declining for the last year. But going back to mid-2011, we see a large drop in overall output and production. 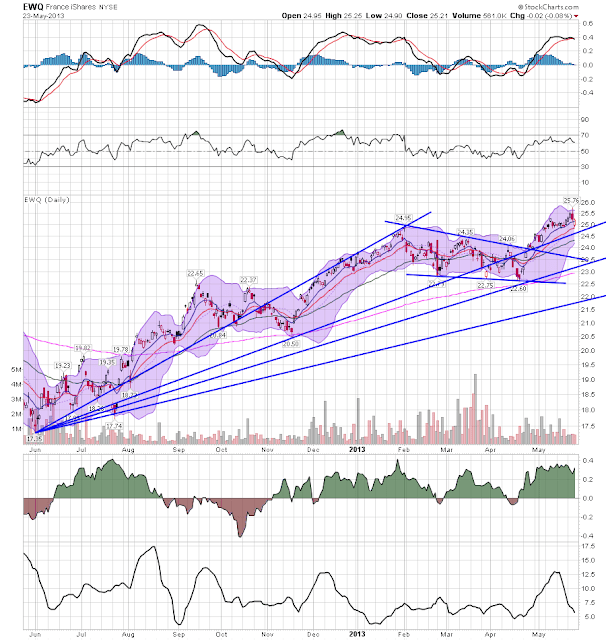 Despite my bearishness on the French economy, the French ETF continues to move higher. We essentially see three market stages over the last year: a rally from 17.5 to 25 over the June-February time period, a market consolidation from February to the end of April when we see an ~10% correction, and then a rally from mid-April to now as the market rallies in response to the return of the risk on trade. At 340,000 this week, and with the 4 week moving average at 339,500, initial jobless claims continue to hover just slightly above what would be a normal expansionary number of 335,000 or below. Last year we rarely got below360,000. This year since January we have rarely been above it. Given the fiscal headwinds of the payroll tax increase and the Sequester, this is pretty robust. We continue to make progress. Frustrating and maybe even glacial, but progress nevertheless. For the last five quarters, the GDPs annual growth rate and been negative. More importantly, it's getting worse. The quarterly rate of growth has been negative for six straight quarters. While the rate of contraction is mild by historical comparison (most depressions see larger percentage contractions), the bottom line is growth has not existed in this region for over a year. From hereon, I will be referring to the EU's economic situation as a depression. There is no other way to describe it. Japan’s economy expanded the most in a year last quarter as consumer spending and export gains outweighed the weakest business investment since the wake of the March 2011 earthquake and tsunami. 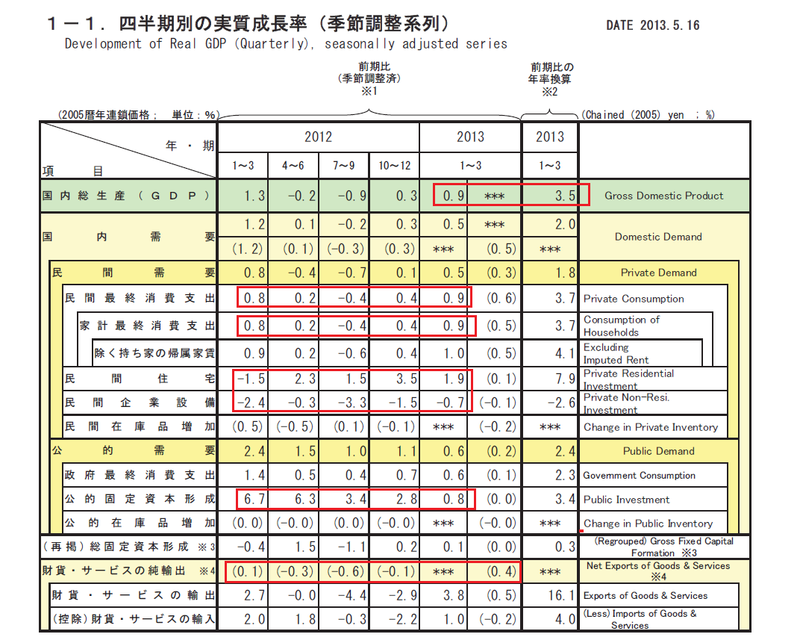 Gross domestic product rose an annualized 3.5 percent, a Cabinet Office release showed in Tokyo. Private consumption, making up 60 percent of GDP, contributed 2.3 percentage points to the jump. The Bank of Japan may upgrade its assessment of the economy after a May 22 policy meeting, according to people familiar with the central bank’s discussions. Abe said he aims to get annual private investment back to 70 trillion yen ($682 billion), the level before the 2008 financial crisis, through deregulation, taxes, spending, and equipment leasing deals. He also outlined a target of tripling infrastructure exports to about 30 trillion yen by 2020. Abe has said he will reveal his full growth plan ahead of the Group of Eight summit in Northern Ireland on June 17-18. The measures are part of the “third arrow” of the prime minister’s strategy to revive the world’s third-largest economy through structural changes to improve competitiveness. His push for increased Bank of Japan monetary easing combined with fiscal stimulus has persuaded Japanese to open their wallets and sent stocks soaring as the yen weakens. “We have gained international understanding for Abenomics,” Abe said. Finance ministers and central bankers reaffirmed their February commitment to “not target exchange rates” at a meeting in Aylesbury, near London, U.K. Chancellor of the Exchequer George Osborne told reporters May 11. The Bank of Japan “can and should ease again if the current measure does not seem to be working,” Takuji Okubo, chief economist at Japan Macro Advisors in Tokyo, said in an e-mailed response to questions. While signaling acceptance of the yen’s decline through 100 per dollar for the first time since 2009, G-7 policy makers said they examined Japan’s strategy and that they will monitor its impact on currencies. The yen has fallen 15 percent against the dollar this year and 13 percent versus the euro as the Bank of Japan stepped up monetary stimulus. Japan's economy has started picking up. Exports have stopped decreasing as overseas economies have been moving out of the deceleration phase that had continued since last year and are gradually heading toward a pick-up. Business fixed investment continues to show resilience in nonmanufacturing and appears to have stopped weakening on the whole. Public investment has continued to increase, and housing investment has generally been picking up. Private consumption has seen increased resilience, assisted by the improvement in consumer sentiment. Reflecting these developments in demand both at home and abroad, industrial production has stopped decreasing and signs of picking up have become increasingly evident. Meanwhile, financial conditions are accommodative. On the price front, the year-on-year rate of change in the consumer price index (CPI, all items less fresh food) has been negative, due to the reversal of the previous year's movements in 2 energy-related and durable consumer goods. Some indicators suggest a rise in inflation expectations. The daily chart shows a strong rally starting in mid-November, with a nice balance between rallies and consolidation. 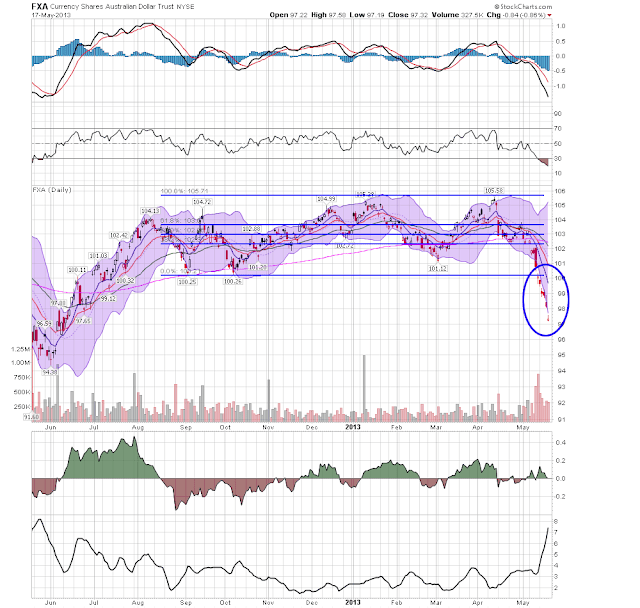 The EMAs are bullishly aligned with prices using the EMA for technical support. The MACD is strong, but it has stalled over the last month and a half. However, the CMF remains strong. The dollar ETF bounced along the 21.6 price area for the September-February period, with a brief rally to the 50% Fib level from the July-August sell off. Starting in February we see a rally, the hit resistance at the 61.8% Fib level from the same sell-off. 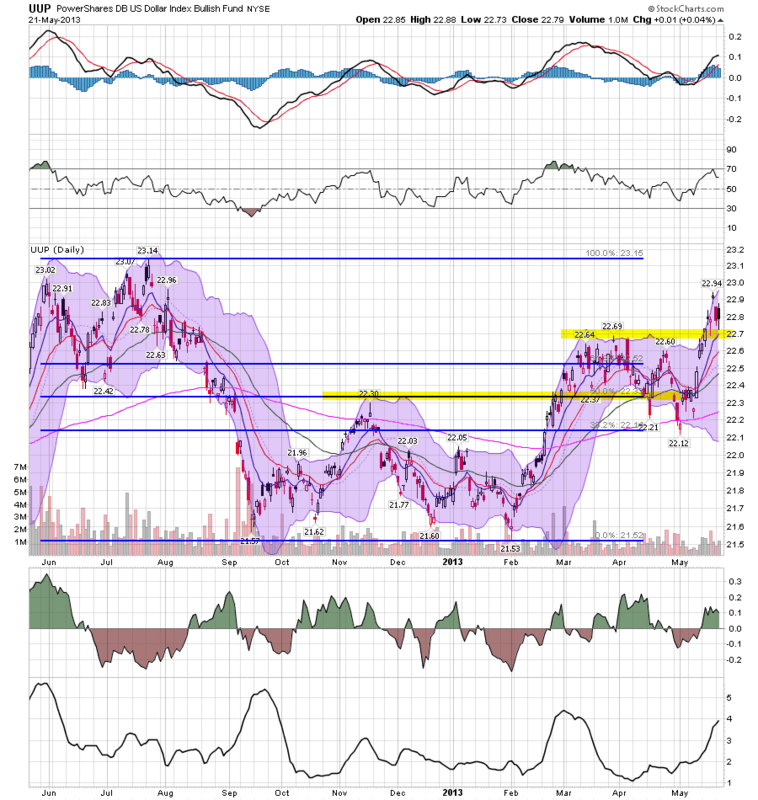 Now prices have cleared resistance at all Fib levels and have room to rally to the lower 23s/. In normal times, an arithmetic mistake in an economics paper would be a complete nonevent as far as the wider world was concerned. But in April 2013, the discovery of such a mistake—actually, a coding error in a spreadsheet, coupled with several other flaws in the analysis—not only became the talk of the economics profession, but made headlines. Looking back, we might even conclude that it changed the course of policy. Why? Because the paper in question, “Growth in a Time of Debt,” by the Harvard economists Carmen Reinhart and Kenneth Rogoff, had acquired touchstone status in the debate over economic policy. Ever since the paper was first circulated, austerians—advocates of fiscal austerity, of immediate sharp cuts in government spending—had cited its alleged findings to defend their position and attack their critics. Again and again, suggestions that, as John Maynard Keynes once argued, “the boom, not the slump, is the right time for austerity”—that cuts should wait until economies were stronger—were met with declarations that Reinhart and Rogoff had shown that waiting would be disastrous, that economies fall off a cliff once government debt exceeds 90 percent of GDP. Indeed, Reinhart-Rogoff may have had more immediate influence on public debate than any previous paper in the history of economics. The 90 percent claim was cited as the decisive argument for austerity by figures ranging from Paul Ryan, the former vice-presidential candidate who chairs the House budget committee, to Olli Rehn, the top economic official at the European Commission, to the editorial board of The Washington Post. So the revelation that the supposed 90 percent threshold was an artifact of programming mistakes, data omissions, and peculiar statistical techniques suddenly made a remarkable number of prominent people look foolish. The real mystery, however, was why Reinhart-Rogoff was ever taken seriously, let alone canonized, in the first place. Right from the beginning, critics raised strong concerns about the paper’s methodology and conclusions, concerns that should have been enough to give everyone pause. Moreover, Reinhart-Rogoff was actually the second example of a paper seized on as decisive evidence in favor of austerity economics, only to fall apart on careful scrutiny. Much the same thing happened, albeit less spectacularly, after austerians became infatuated with a paper by Alberto Alesina and Silvia Ardagna purporting to show that slashing government spending would have little adverse impact on economic growth and might even be expansionary. Surely that experience should have inspired some caution. Does Oil Now Have A Price Ceiling In the $98-$100 Area? 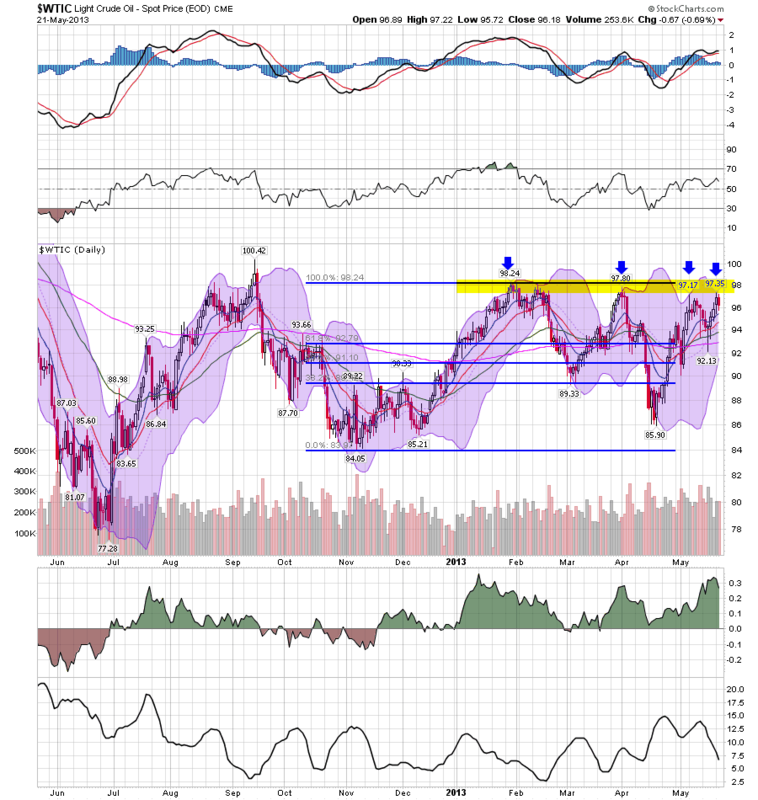 The chart above shows that since the beginning of 2013, oil has hit the $98-$100 price area four times. Each time, it has retreated. The question is, why? 1.) Overall, world growth is slow. The strongest country -- China -- is in the midst of a slowdown (albeit from 10% growth to 7%). All other economies are experiencing similar slowdowns. Some parts of the globe (the EU) are in the middle of a prolonged recession. Money managers are the most bearish on commodities in more than four years as a majority expected a weaker Chinese economy for the first time in 14 months, a Bank of America Corp. survey showed. A net 29 percent of the fund managers surveyed were underweight the asset class in May as their positions “collapsed” to the lowest level since December 2008. One in four now consider a “hard landing” in China as the biggest risk to their investments. The bank surveyed professional investors who together oversee $517 billion. North America will provide 40 percent of new supplies to 2018 through the development of light, tight oil and oil sands, while the contribution from the Organization of Petroleum Exporting Countries will slip to 30 percent, according to the International Energy Agency. The IEA trimmed global fuel demand estimates for the next four years, and predicted that consumption in emerging economies may overtake developed nations this year. “The supply shock created by a surge in North American oil production will be as transformative to the market over the next five years as was the rise of Chinese demand over the last 15,” the Paris-based adviser to 28 oil-consuming nations said in its medium-term market report today. The development of U.S. shale resources, enabling the nation’s highest level of energy independence in two decades, is creating a “chain reaction” in the global transportation, processing and storage of oil that may escalate as other countries try to replicate the American oil boom, according to the IEA. Crude futures for settlement in 2018 are trading at a discount to current prices, signaling expectations for increasing supplies and constrained demand. If the current laws that govern federal taxes and spending do not change, the budget deficit will shrink this year to $642 billion, CBO estimates, the smallest shortfall since 2008. Relative to the size of the economy, the deficit this year—at 4.0 percent of gross domestic product (GDP)—will be less than half as large as the shortfall in 2009, which was 10.1 percent of GDP. Health care cost growth has slowed substantially, as the latest projections from the Congressional Budget Office (CBO) make clear Since late 2010, CBO has reduced its projection of cumulative Medicare and Medicaid spending over the 2011-2020 period by $900 billion (or nearly 10 percent over that period). One thing I hope I'm clear about when I discuss the Oil choke collar is that I claim no special knowledge as to what will happen with energy prices in any kind of short term timeframe. My impression is that large speculators can and do push gas prices up and down over the short term roughly between $3 and $4 a gallon, and constantly relieve the suckers of their betting money. Once you get past a few months, the economy reacts to the relatively high or low price by accelerating or decelerating. In this way the price of gas acts like a governor on the speed of the economy. I do believe that increased efficiency, alternate sources of energy, and new discoveries of petroleum will act over the longer term to lower prices, and that may have already started this year, but we will see. Following my back of the envelope formula, take this increase, divide it by 10 (or 16 if you want to be conservative), and add 0.1%, and you should be very close to the non-seasonally adjusted inflation rate for the month. This gives us a +0.5% or +0.6% increase in prices for May - as of now. Since there is no significant seasonal adjustment this month, that will also be the adjusted inflation rate. This will also have a significant effect on real wages and sales. Once again, I'm going to turn to the new employment graph started by the Macroblog website, this time focusing on employer behavior. 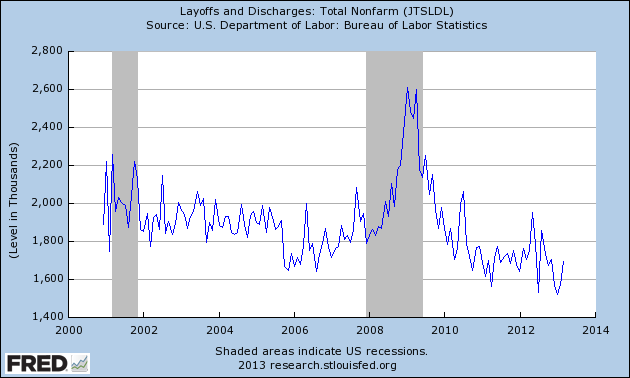 And for that, I'll be looking at JOLTS data. This is a relatively new data set -- in only goes back to the beginning of the 2000s. This means we don't have the ability to do any historical comparisons. However, it does give us an objective reading on what employers are doing in the jobs market, which in turn gives us an idea to what they're thinking. Total layoffs are now at levels below the last expansion. This tells us that employers aren't adding to the unemployment rate at a high rate. Here's the definition used by the BLS for this data: a job opening is [a] specific position of employment to be filled at an establishment; conditions include the following: there is work available for that position, the job could start within 30 days, and the employer is actively recruiting for the position. Put another way, if an employer is looking to add to his workforce, he will advertise a job opening to fill. This number -- like most employment numbers -- cratered during the recession. But, it's been slowly bouncing back to levels seen during the last expansion. However, note that during 2012 the data series appeared to stall between the 3.6 and 3.8 million level. This was also during the period when employment growth seemed to stall at moderate levels. Like the openings data, this number appeared to stall during the 2012 period. However, the level at which the data series stalled was a the lowest point of the previous expansion. 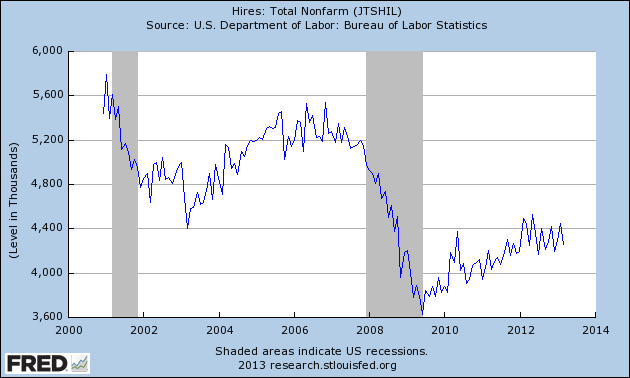 This tells as that the rate of hiring is still at very low levels. These two data points are interesting. 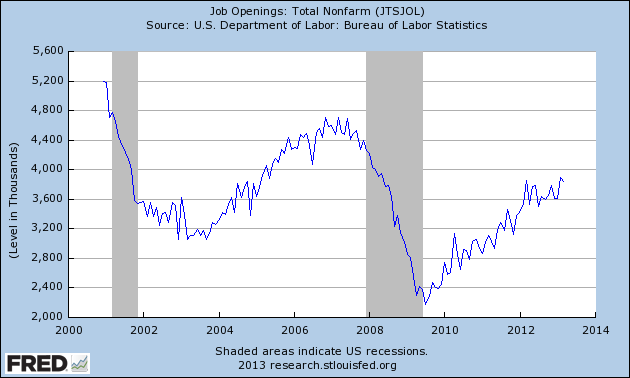 While the job openings number has bounced back, the job hires numbers have not. So while employers want to increase their labor force by posting an opening, they are very unwilling to make the final commitment and hire a person. One is the weakness in commodity prices. Iron ore, Australia’s most valuable commodity export, slipped into bear market territory last week amid concerns about slowing economic growth in China. “Iron ore is down 20 per cent from the highs in February and coking coal has seen similar price action,” notes Robert Rennie, global currency strategist at Westpac. A second is the slowdown in foreign direct investment as large resources companies slash spending on new projects and expansion in Australia. The recent reduction in the RBA’s benchmark rate to 2.75 per cent has also eroded the attractiveness of the Aussie by narrowing the interest rate differential with the US, where rates are effectively zero. Many economists believe the RBA will be forced to lower rates again to help rebalance the economy as the resources investment boom peaks. Coffee futures have been under heavy selling pressure in recent sessions as traders worried over ample global supplies and speculators pushed prices lower. Sugar prices fell to the weakest level since August 2010 last week as farmers in Brazil started to accelerate harvesting of the nation's sugar crops. Sugar growers in Brazil's center-south region, which accounts for about 90% of the country's production, are forecast to harvest a record 589.6 million metric tons of sugar cane in the 2013-14 season, according to Unica, Brazil's sugar industry association. 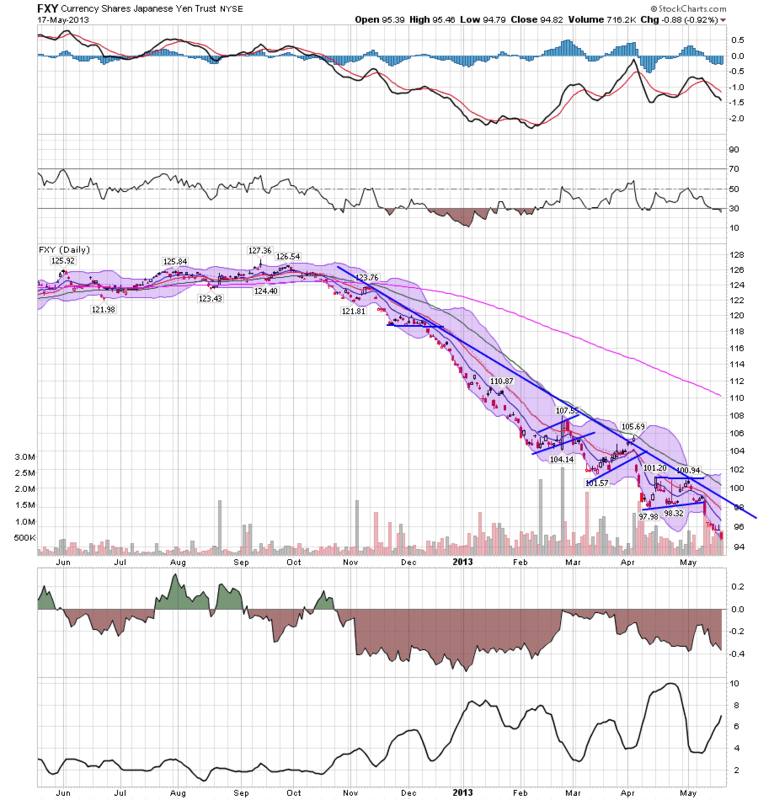 Prices are in a classic downtrend. Most importantly, notice the 200 day EMA is clearly moving lower and that prices are below this key indicator. The shorter EMAs are also moving lower and are below the 200 day EMA. Mathematically, this will continue to pull the 200 day lower. Candles are using the 10, 20 and 50 day EMAs are technical resistance, which is another sign of a bear market. Prices are moving lower lows and lower highs as well. Short version: this is a great example of a bear market chart. Last week, we received continued confirmation that the US economy is growing, although at a weak pace. Let's look at the day. LEIs Increased: (From the report): The Conference Board LEI for the U.S. increased in April after a small decline the month before. Large positive contributions from building permits, initial claims for unemployment insurance (inverted) and all the financial components offset negative contributions from consumer expectations, average workweek in manufacturing and ISM® new orders. In the six-month period ending April 2013, the leading economic index increased 1.7 percent (about a 3.5 percent annual rate), faster than the growth of 0.5 percent (about a 1.1 percent annual rate) during the previous six months. 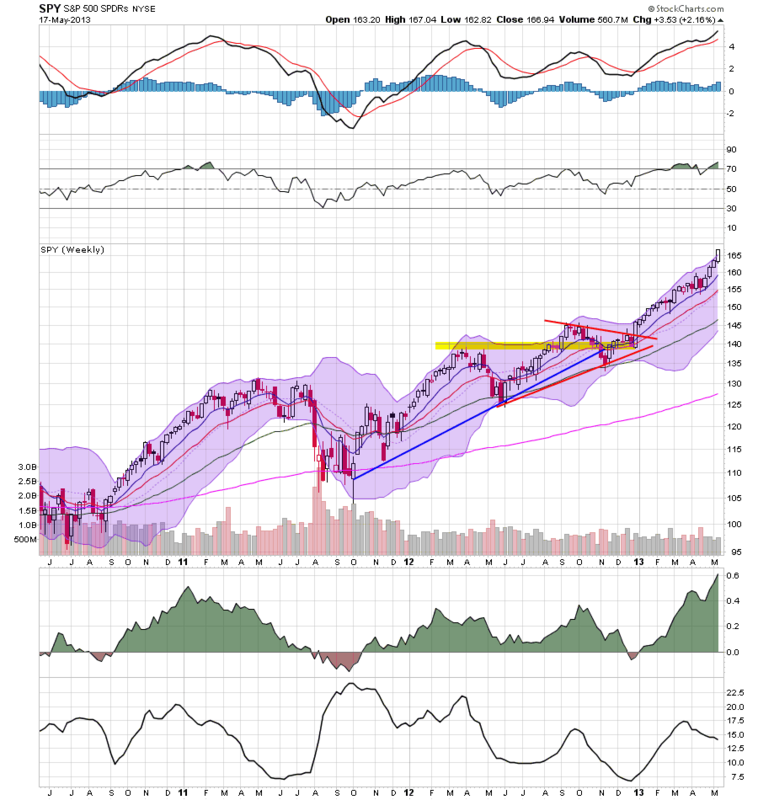 In addition, the strengths among the leading indicators have become more widespread. Of the 10 components, 3 were negative. This tells us there was a fair amount of breadth to the latest reading. In the preceding LEI reading, the components were equally balanced between positive and negative, leading to the .1% contraction. Most concerning in this data is the continued weak reading in the average workweek for production workers, which has been stable for seven months. Consumer Sentiment Increased: Consumer spirits are improving dramatically this month in what very well may be a reflection of improvement in the jobs market. The consumer sentiment index jumped to 83.7 for the mid-month reading vs 76.4 for the final April reading and vs April's mid-month reading of 72.3. The Econoday consensus was looking for 78.0 with the high-end estimate at 82.5. The latest reading is near the recovery high set in November. Consumer activity has been remarkably resilient after the increase in withholding taxes at the beginning of the year. Considering this is still 70% of US economic activity, this increase is a good thing. As I noted several times last week (see here, here, here and here) inflation is a non-issue right now. In fact, one could argue that the greater threat is still one of potential deflation rather than inflation. Housing metrics took a hit: housing starts decreased 16.5% from the previous month. However, housing permits increased 14.3%. As of now, this is a one month statistical point that could simply be noise. However, we do want to keep an eye on this metric as the housing market's rebound is a very important part of the ongoing recovery in the US economy. Manufacturing took more hits: As I noted above, the near stagnation in the workweek for production workers over the last seven months is concerning. In addition, the Empire State manufacturing number fell to -1.4, the Philly Fed manufacturing number fell to -5.2 and industrial production contracted .5%. The IP contracted was especially concerning as it's decline was very broad based. Manufacturing renaissance in the US has been a most untold story for this expansion. However the recent spate of data -- especially its broad base -- indicates an overall slowdown may be occurring. This does not appear to be a contraction, but a reading just above expansion on the next ISM number (a reading just above 50) looks more and more likely. Conclusion: we're still where we've been for an extended period of time. The US economy is growing, albeit weakly. Both internal and external demand is weak at best. We're also probably seeing some effects from the sequester kick in. The SPYs are still very much in a bull market. 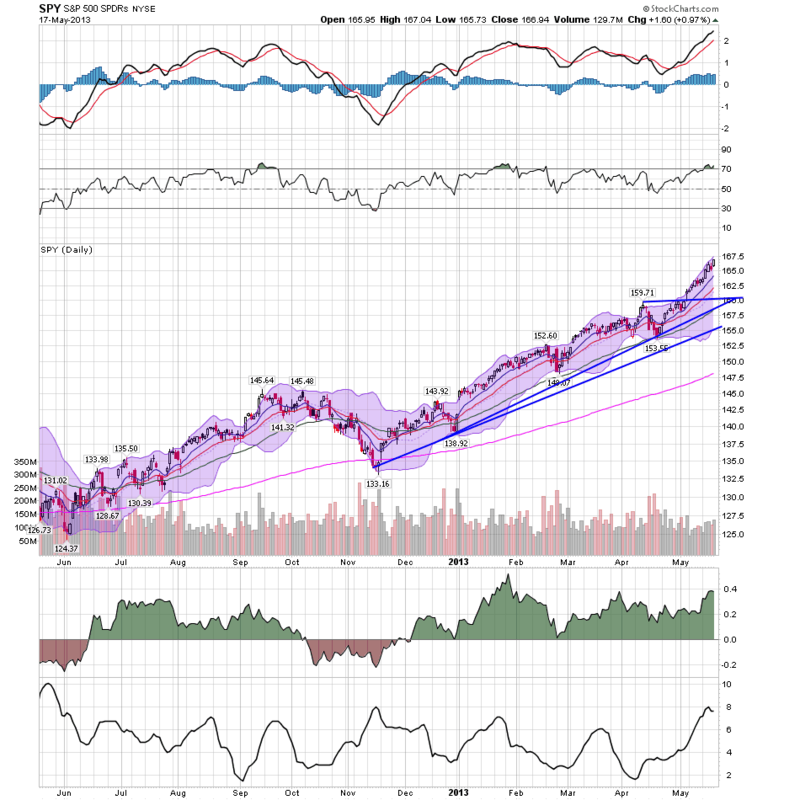 The uptrend started in mid-November continues to move higher, with the index printing a series of higher highs and higher lows. The EMAs continue in their bullish orientation -- all are rising, the shorter EMAs are above the longer EMAs and prices are above all the EMAs. Momentum is positive and increasing and money is flowing into the market. The weekly chart displays the exact same patterns. 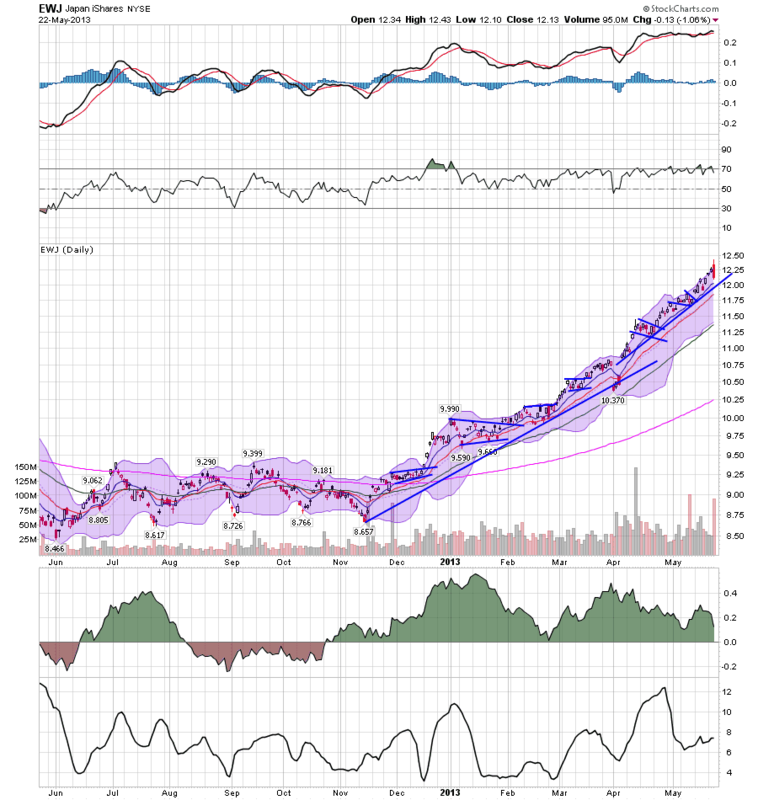 Prices are printing higher highs and higher lows with a bullish underlying EMA picture. Momentum is positive and strong and the CMF reading shows a big influx of money. A thought for Sunday: Four years ago - "Do we need another WPA?" From Bonddad: NDD wanted to re-post this piece with which I heartily agree. Repeat after me: borrow $1 trillion dollars at today's record low rates, hire the out-of-work manufacturing and construction workers and rebuild our nation's crumbling infrastructure. "So the point I'm making -- and Blanche is exactly right -- we've got to be non-ideological about our approach to these things. ... We don't want to be looking backwards. We can't just go back to the New Deal and try to grab all the same policies of the 1930s and think somehow they'd work in the 21st century." Four years ago on Friday, Bonddad and i published a joint essay entitled, Do we need another WPA? I'm republishing it in a mildly truncated form below, deleting graphs and a little other information that is no longer timely. Obviously not all of our prognostications were perfect, but they have proven close enough that, wIth unemployment still at 7,5%, the u-6 employment rate including discouraged workers still at about 14%, and employment still about 6 million short of a population adjusted full recovery, it's fair to suggest that Bonddad and I have been proven right, and Barack Obama wrong. This is the road not taken. The Very Serious People should be asked on what basis they can still justify their decision not to take it. How much better the conditions would be now for millions of American families had we taken it! If ever there was a time to reinstitute the CCC and the WPA, the large scale public works employment programs which were the cornerstones of the "RELIEF" element of the New Deal, now is it! Even extended unemployment benefits will run out far too soon, leaving many able - bodied and - brained workers sitting unproductively and sullenly at home. Putting them to work on public sector projects would not just be important symbolically to society, and psychologically to the workers and their families, but would produce real and long-lating tangible benefits as well. The Civilian Conservation Corps, a work relief program for young men ages 18-25 from unemployed families, was established in 1933. The CCC became one of the most popular New Deal programs among the general public and operated in every U.S. state and several territories in 2600 work camps. The young men were paid wages, but were expected to share their wages with their families. They built such things as fire trails, camp sites in parks, and also cleared swamps and planted trees. Obama's $787 Billion stimulus program has a lot in common with FDR's: An author, economist and historian who have all studied the Depression agree Obama's stimulus plan might do for a somewhat different crisis what FDR's public works programs did for even worse times. Author Nick Taylor said both FDR and Obama made job creation through infrastructure improvements the "main thrusts" of national initiatives to solve economic crises each inherited from prior administrations. The author of "American-Made: The Enduring Legacy of the WPA," he said Obama's critics don't acknowledge that creation of the WPA and CCC helped lower unemployment from 25 to 14 percent between 1933 and 1937. .... Associate Professor Harold Petersen, who teaches economics at Boston College, believes ... FDR and Obama both made sound decisions, based on the valid principle that spending drives economic growth, to create job programs that put money in peoples' hands. .... Professor William Keylor, who teaches history at Boston University, said ...."It does indeed sound like what FDR was up to. Our infrastructure is in bad shape. If done efficiently, these projects could really improve our communities." Yet the number of unemployed people remains at high levels as I noted in this article. These is no reason to see this situation ameliorating any time soon. In fact, I expect that we'll be hearing about a "jobless recovery" when things start picking up. In short, this is not an environment when people ramp up spending. Combine that with a high level of household debt. Total household debt outstanding is almost as high as total US GDP. 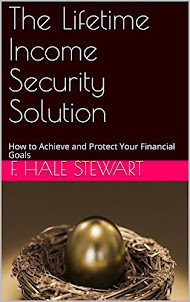 Simply put, people need to de-lever their financial position. Leading to that de-leveraging is the massive loss of household wealth that has occurred over the last two years. Total household wealth stood at $64.3 trillion in 2Q07 and currently stands at $51.4 trillion -- a decrease of 20%. All of these factors add up to a consumer who will not be driving the recovery. It has dropped in 9 of the last 12 quarters -- and one of the quarters where we saw in incease was only an increase of .4%. In addition, last quarter saw a decrease of 51.8% from the preceding quarter. Simply put, that number is terrible. Let's break this number down into its sub-parts -- residential investment, non-residential investment and equipment and software investment. The existing home inventory is still at very high levels. And this number does not include the "shadow inventory" of houses in foreclosure that are still on bank's balance sheets. Housing starts are at multi-decade lows. In other words, we're not building our way out of this recession. Non-residential Here is a chart of the percentage change from the preceding quarter in non-residential structure investment. Last quarter this number dropped by 44.2%. Also note this number continued to increase until the 4Q08. In other words, this area of the economy is just starting to contract. Considering the severity of last months drop and the continued tight credit conditions it's difficult to see this area of the economy picking up any time soon. There is no reason to invest when you've not using what you already have. While the overall trend of economic numbers is moderating that does not mean we have the driving force to get us out of the hole we're in. People don't just start spending money; businesses don't just start investing. Someone has to make the first move. And that's where Keynsean policies come into play. A WPA would accomplish several tasks. It would lower the overall long-term unemployment rate for a period of time. In addition, it would also increase domestic investment in areas we need like infra-structure. Finally, it would provide the force to get us out of the hole. While the economic numbers are getting better we need that "something" to get the numbers moving higher. And no other area of the economy appears ready to provide that push.